An Iraq war veteran from Eastbourne caught driving dangerously on the A27 on the way home from the pub has been sent to jail. Officers spotted James French driving on the wrong side of the road as he sought to overtake cars on a hazardous stretch of the A27 near Berwick, a court heard. French, 31, of Pevensey Road in Eastbourne, had already spent time in prison for attacking his former girlfriend, and appeared in court again on Wednesday. 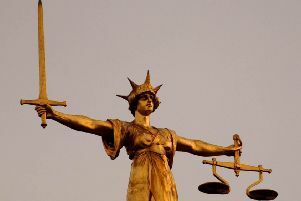 He pleaded guilty to dangerous driving, driving with excess alcohol, breaching a restraining order, criminal damage and committing an offence while the subject of a suspended sentence. Police saw other drivers having to swerve out of the way to avoid a head-on crash and so activated their sirens and followed French, prosecutor Beverly Cheryl told the court. French pulled over and officers went over to speak to him. “They sought to arrest him for dangerous driving. Back at the police station tests revealed 47 micrograms of alcohol in 100 millilitres of his breath – well above the legal limit of 35 micrograms. Prosecutor Ms Cheryl described the incident as ‘prolonged bad driving’ where ‘there was a risk of serious injury to other road users’. The court heard that French has a previous conviction for battery, for which he was sent to jail. Defence barrister Richard Body said: “He was at a public house. He was having a few drinks and he did not intend to drive that day. French has shown ‘regret and signs of remorse’, his barrister said. He also asked that French be given credit for his service in the military, including serving in Iraq and in the 1st Battalion stationed at Paderborn in Germany. Judge Shani Barnes said: “You have had a lot of difficulties clearly because you have been back before the courts for 15 convictions for 30 offences. French was jailed for 10 months and disqualified from driving for three years and 112 days.